The Pawtucket Red Sox are commemorating the Veterans Day holiday by welcoming veterans to a steak dinner at McCoy Stadium tonight (Friday). For the fourth straight year, the PawSox this evening are presenting a four-course steak dinner inside the PawSox Clubhouse. The guests also receive a tour of McCoy and gifts from the PawSox. The honorees are veterans from the YWCA of Rhode Island Gateway to Independence, the Rhode Island Military Organization, Chapter 3 of the Pawtucket DAV, Central Falls American Legion Post 79, Newport VFW Post 406, RI Association of Fire Chiefs Honor Flights, and Operation Stand Down. 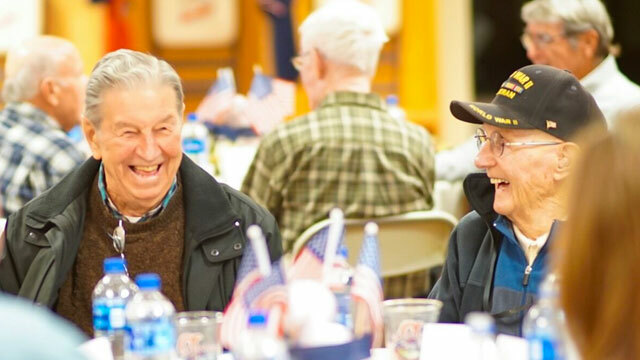 "Hosting veterans in 2015 was our first community event after several of us joined the ballclub, and it was inspiring," PawSox President Dr. Charles Steinberg said. "We have since turned this into a traditional gathering that we very much look forward to around the Veterans Day holiday. This modest gestures allow us to continue to demonstrate our appreciation to those who have served our country."